Platforms extant with track still in place on the up side but now out of use. Station building at the end of a gated approach road is now a private residence. Notes: Barnwell Junction was the first station on the Mildenhall branch and opened with the Cambridge - Fordham section on 2 June 1884. Whereas the Railway Clearing House and Ordnance Survey referred to the station as ‘Barnwell Junction’, and the British Railways signs carried this name, in timetables it seems always to have been simply ‘Barnwell’. Built on the site of a former gravel pit, it was 1 mile 56 chains north of Cambridge station but still within what is today the City of Cambridge. 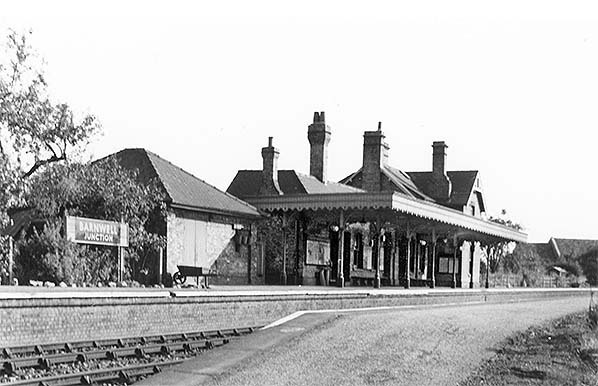 The station was a little odd in that was immediately adjacent to the Cambridge - Ely line yet had platforms serving only the Mildenhall branch, so it was not, strictly speaking, a junction at all. The down platform was 380ft long and the up platform 370ft; the former had an ornate waiting room of a style typical along the branch. It comprised a single-storey timber building with a pitched slate roof. The structure was painted white but with diagonal and vertical details picked out in black to give an attractive half-timbered effect. The central doorway was placed under a small gable and pairs of six-light windows are either side of the door. Brick chimneystacks were placed at each gable end, their tops stepped out to give them prominence. The signal box was located behind the waiting room adjacent to the up main line, while the main station buildings were on the up side. With the exception of Quy and Swaffham Prior, station buildings on the Mildenhall branch were built to a standard pattern. The single-storey range contained a booking hall, stationmaster's office, waiting room, toilets and staff room. The L-plan brick building under a slate roof included a two-storey stationmaster’s house with the single-storey range attached. On the two-storey section, facing the forecourt, the principal gable was under a half-hipped roof, and a slightly recessed section adjoining the office range was treated to its own pitched gable with timber braces. The door of the office range which gave access to the booking hall was sheltered by a gabled porch supported on brackets, and beyond it was a large unadorned gable. There appears to have been only one doorway onto the platform, so presumably the waiting room was also entered from the booking hall. Gents' toilets were entered from the platform while ladies’ toilets would been en suite with the waiting room. Separate brick lock-ups were provided at most stations but where they were not, station buildings incorporated a small parcels lock-up. Fireplaces were provided in each room with semi-ornate stepped chimneystacks on the roof. The building was provided with a flat canopy with a deep valance, a style favoured by the Great Eastern Railway. It stretched the length of the single-storey range and beyond the full platform width, and was supported on five timber columns. There was never any form of canopy on the down platform as far as is known. Barnwell Junction station per se had no goods facilities, other than for parcels, for its entire life and in this respect it was unique on the Mildenhall branch - if we are, obviously, to discount the three halts. The goods yard was located on the down side of the main line and was thus remote from the Mildenhall branch. The yard was provided with the basics of most goods yards: weighbridge, scales and loading gauge. There appears to have been no provision for cattle or other livestock. The station was also unique in that it was the only one on the Mildenhall branch to receive BR totems, running-in boards and other signage, if we are to discount Fordham which technically was located on the Ely - Newmarket / Bury line. It is not clear how many totems were provided as the existence of two (possibly 3) is confirmed by photographs. There was also a large BR blue board immediately south of the station proclaiming 'Cambridge 1 Mile' with a large arrow pointing south, although the stated distance was a little inaccurate. Quite why Barnwell Junction was given this treatment by BR is something of a mystery, more so when considering the passenger service at the station was for its entire life woefully infrequent. Furthermore and even odder, if photographs and the dates accompanying them are to be believed Barnwell Junction did not gain BR Eastern Region blue enamel signage until after Cambridge station lost its totems. Certainly, at least one (of the two) Great Eastern Railway running-in boards was still present in 1957. During wartime, Barnwell Junction was used for unloading ambulance trains; it is believed to have done so in WW1 and certainly did in WWII, but exactly how these lengthy trains were handled at such a small station is not known. 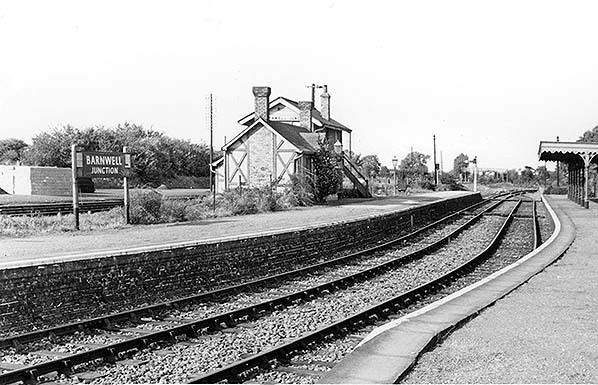 At 4.24pm on Saturday 16 June 1962 the final timetabled passenger train called at Barnwell Junction and with its departure the station closed - there being no goods facilities for the branch goods train, which continued for a further two years, to serve. For readers not familiar with the administrative side of railway closures to passengers, the closure date is officially the first weekday following the running of the final train and this is usually a Monday. This procedure is followed irrespective of whether a line continues to be used by goods trains, as was the case with the Mildenhall branch. Soon after closure to passengers the down platform road was lifted and the up platform road remained to serve an oil depot around the curve towards Fen Ditton. Click here for further information about the oil siding. As of May 2015 this track remains in situ but disused, overgrown and disconnected at its junction with the main line. The station itself was sold intact immediately after closure and; it was curious to see totems other signage, the mandatory closure notice, a timetable and other posters still in place long after the last train had gone but while trains still thundered by on the adjacent main line. The goods yard, isolated on the other side of the main line, remained rail-connected until 1966 when it closed on 31 October, and the track was soon lifted. The former yard remained in use by a coal merchant at least into the late 1970s but, of course, no longer rail-served. Barnwell Junction signal box was closed and demolished soon after the goods yard was closed but its remains could still be seen dumped on the down platform for some time afterwards. Subsequent to closure, the station became well known for the Pullman car which sat on a specially-laid length of track behind the country end of the up platform. When the station was viewed from Newmarket Road, the Pullman was largely hidden by the grounded bodies of three ex-Southern vans but it was clearly visible from passing main line trains. Named Montana, it was originally Car No.156 and was built by the Birmingham Railway Carriage & Wagon Co. in 1923 for Southern Railway use. Latterly a BR camping coach, it was sold in 1967 and taken to Barnwell Junction for residential use and there it remained for forty years. In 2007 it was removed and taken to Petworth, Sussex, for restoration. To date, it was the final railway vehicle to traverse the remains of the Mildenhall branch and was dragged round to the oil terminal by a forklift tractor from where it was removed by road and some details and pictures can be seen on the Southern E-Group website: scroll to Page 12.. 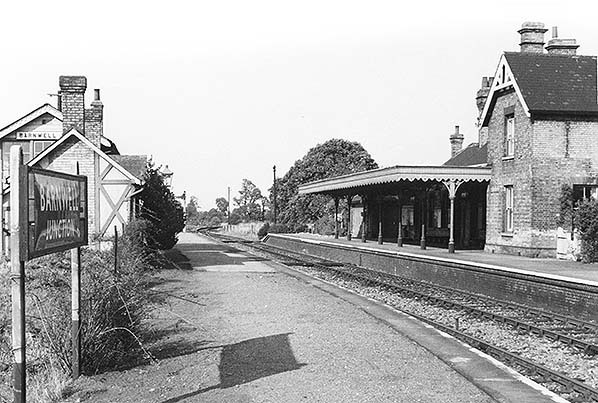 Given that, until the modern island platform opened, Cambridge station had limited platform capacity , the question has been asked why certain trains could not have continued north from Cambridge to terminate at Barnwell Junction. This scenario might have been suitable for DMU services to / from King's Cross for example, with the added bonus of providing a direct service to London from the north-east side of Cambridge. In the event Barnwell Junction station was sold and track and signalling rationalised, while such potentially good ideas were just not on the accountant-controlled BR agenda in the 1950s and 1960s. Click here to see an LNER signal box diagram for Barnwell Junction. Tickets from Michael Stewart, except 1034 David Pearson. Route map drawn by Alan Young. Totem from Richard Furness. Click here to see a 17 minute colour film of a steam locomotive travelling from Cambridge to Mildenhall in 1959. Includes all the stations on the line, Fron Cambridge Community Archive Network. 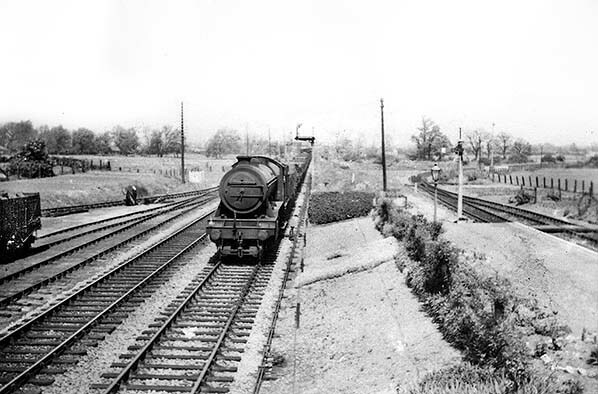 View from a down train as it departs Barnwell Junction in May 1957. The position of the shadows tells us it is early in the morning, so the train will be the 6.28am from Cambridge. This train did not call at the halts and by June the following year it ran non-stop to Fordham and then called only at Isleham on its way to Mildenhall. At the time of the photograph, BR Eastern Region signage had yet to appear. The small building behind the running-in board is recorded as being a store and was the only part of the station not to survive, signal box excepted. Similar store buildings appeared at other stations along the branch. The white cylindrical objects on the platform were planters. 1888 1:2,500 OS map. This map shows Barnwell Junction station in the form in which it was to remain for its entire career as a passenger station. The double-track junction with the main line was also to remain until withdrawal of passenger services. To the west of the station and on the other side of the main line is Barnwell goods yard with its two 440ft loop sidings, headshunt and single-ended 510ft siding (the so-called Back Road) via a trailing connection with the down main. The single-ended siding served the Brick & Tile Works (not to be confused with the similar works at Coldham's Lane) while the loop sidings seem to have dealt primarily with coal and coke. What is now Newmarket Road curves across the bottom of the map while the road heading north-east from the Globe Inn is today Ditton Walk. Note that at this time the Borough boundary was just east of the station; to the east of the boundary was the parish of Fen Ditton and this remained the case until 1928. The tramway serving the Brick & Tile works was, in all probability, a horse -or man- powered narrow gauge effort. 1909:2,500 OS map. The slightly more detailed map shows little has changed since 1888 other than some residential development on Ditton Walk. At top right we can see the malthouse, better known as the Commercial Brewery, with its sidings and connection to the Mildenhall branch. The malthouse still stands today, albeit long since put to other uses. 1927 1:2,500 OS map. Still nothing has changed on the railway with the exception of an additional trap siding on the spur to the malthouse. The spur was gated and reached via a ground frame in a hut positioned on the down side of the Mildenhall branch. The ground frame was unlocked by Annett's Key obtained from Barnwell Junction. By 1927 there had been further development along Ditton Walk and Newmarket Road. This part of Cambridge was quite industrial; apart from the Brick & Tile works there were once further quarries and gravel pits, the gasworks, the sewage pumping station and, marked on the map, a creamery and the paper mills. The latter gave rise to the now all-but-forgotten name Paper Mills Road and the railway companies referred to Newmarket Road bridge as 'Paper Mills Road Bridge' for a long time after the name became defunct. At some point after 1926 there was a curious addition to the sidings west of the main line, although no maps have yet come to light showing it. In the space immediately north of the bridge on the down side another siding appeared; it was not connected to any of the other sidings and was entered via a trailing connection from the down main just north of the bridge. A ground frame unlocked electrically by Coldham Lane Junction signal box allowed access. We know of its existence owing to surviving signal box diagrams but it seems to have been removed by, or soon after, 1935. The date of the above image is not recorded but it was almost certainly taken around the same time as the previous view. On the down platform the waiting room is seen and behind it the signal box. The Ely line ran directly behind the down platform (see next image). The fence post in the right foreground is curious. There is a tale which says these posts were made from sections of rail used by the contractors building the line. However, given that contractors’ rail was through necessity usually of a lightweight flat-bottom type and that these fence posts were extremely common throughout East Anglia, the tale would seem rather unlikely. If the posts were once rail, it is more likely they were an early type of Bullhead rail which had been discarded by the Great Eastern Railway. To complement the previous view, we have a scene taken from Barnwell Junction signal box at around the time of nationalisation. On the right the down platform can be seen with the track of the Mildenhall branch curving away towards Fen Ditton Halt. This is the section of track which, as of 2015, remains in situ disused and overgrown. A Class K3 2-6-0 approaches on the up main line with a goods train. To the left of the K3 is the down main and to the left of that are the two loop sidings of Barnwell goods yard. The track on the far left is the single-ended siding which once served the Brick & Tile works. Barnwell Junction station was gas-lit from the outset until closure, including the lamp seen adjacent to the signal at the end of the platform. Despite being within the City of Cambridge, the scene is deceptively rural. 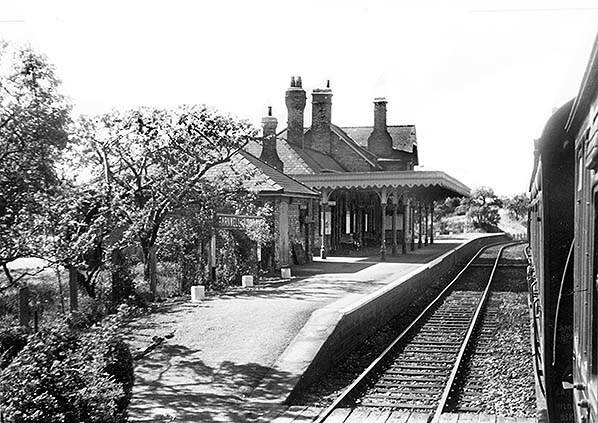 It is a pity that the above image is black and white as the staff kept the station in a quite delightful condition, as can be deduced. Sadly, few passengers sampled its delights - Cambridge station dealt with more passengers each month than Barnwell Junction did in its entire 78-year life. 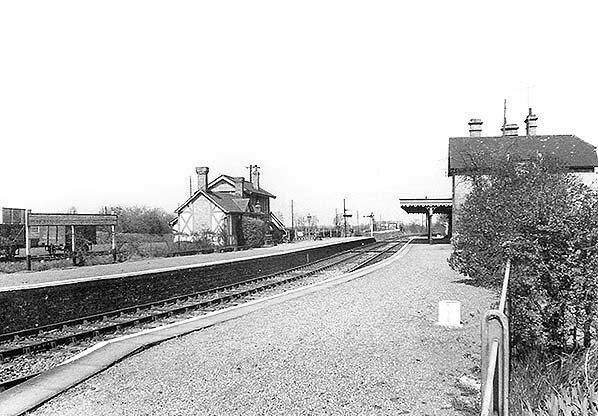 A view of station buildings and up platform from the country end of down platform c1959-62. On the left the Eastern Region blue running-in board can be seen; one of two, the other being on the down platform. The backboard has either been salvaged from elsewhere or made specially to suit the pre-existing mounting posts. One has to wonder why BR did not simply provide a running-in board to suit the original GER backboard onto which the name was applied in one line. BR enamel signs, including totems, were actually manufactured by contractors - close examination reveals at least two totems (possibly three) under the canopy. At the far end of the buildings is the stationmaster's house while nearest the camera is the lock-up store. Identical stores were provided at several stations on the Mildenhall branch. Note the wheelbarrow and stones around the bottom of the running-in board; evidence of efforts to keep the station neat and today. This was common at smaller stations where staff had the time to attend to such matters. In the right background the Leper Chapel can be seen; it still stands to today. The view in the opposite direction to previous image and from London end of up platform c1958-62. The goods yard is still in use at this time but stacks of what appears to be building materials have appeared. By this time there are two builders’ yards on the down side of the main line, one of which occupies the site of the former Brick & Tile works. No totem signs can be seen on the down side so it would appear that the only totems are those under the canopy on the up side. Looking north-east along the down platform at Barnwell Junction station c1958-62. The shadows suggest that the photograph was taken just before sunset.